I promise this will be my last Farm Chicks post. I know so many people have been posting about it, you may be getting a little tired of hearing about it. As I mentioned in my previous two posts, it was an amazing show. The energy was so wonderful. Everyone so happy to be there. Such a party atmosphere. Something I had never experienced at any other show (with the exception of last year's FC show). The clapping and hollering at the beginning and then at the end of the show was so sweet. Made me feel like I was part of something really special. Compared to last year's show, I did a little better sales wise. I wasn't sure what to expect with the recession and everything, but people were definitely buying. 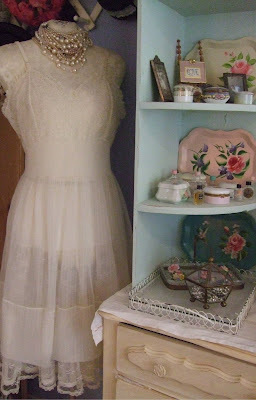 The big things I sold were the minty green dresser, the end tables that my hubby had made out of the old vanity, the two other end tables I took, the pink vanity which you can see in the last post and a vintage iron crib/settee. I was pretty pleased with that but of course would have loved to sell more bigger items as you never want feel like you are taking home almost as much as you brought. 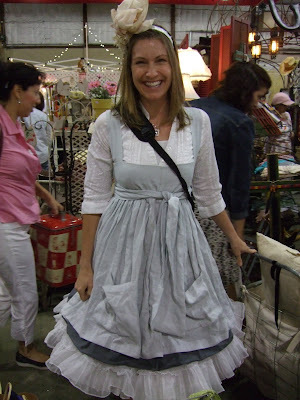 Smaller items I sold included all 8 shopping carts I brought (7 with liners), all my crinolines (the last two sold in the last minutes of the show), (here is Kim from Mimi Charmante wearing a crinoline she bought from me. She was so adorable!) three of my blingy belt buckles (more on that later), lots and lots of bling that I had displayed on a wire dress form (thanks Mitzi), some lamps, linens, cowboy boots, old frames and lots of other little odds and ends. Overall, I was thrilled! I still have three more shows this summer so it's okay that I came home with some stuff. As I mentioned before, I didn't have much time to shop, but I did pick up a few treasures. 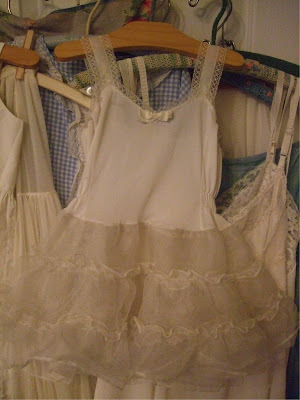 From my sweet neighbors at Cedar House Soaps, I bought this adorable little baby slip with crinoline, a lovely vintage slip and another vintage crinoline. Now being proudly worn by Manni. 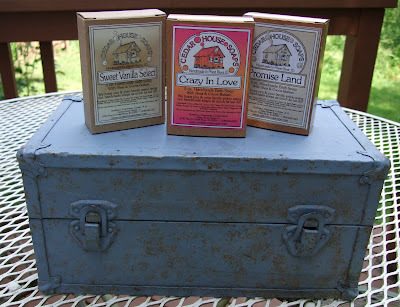 I also bought some yummy smelling soap from them too. This adorable couple were my neighbors last year too and they couldn't have been sweeter. I wish I had got a picture of them. Next year for sure. The cute little blue doll case came from a sale across the street from the fair grounds. I love how the paper inside matches the outside. In case you didn't know, I'm a matchy, matchy kind of gal. 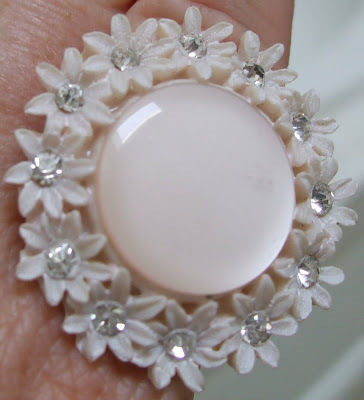 I got this cute ring from Vicky and Beth at Gossamer Designs. 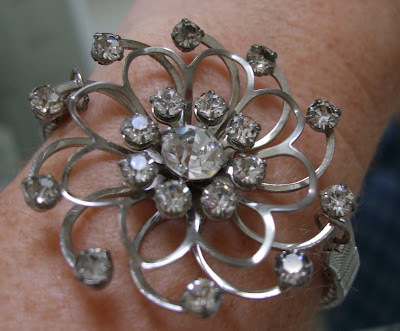 I also found this adorable bracelet made from a vintage watch band and a rhinestone brooch. It's so me! Another thing I found was an adorable chippy pink toilet paper holder, but unfortunately I haven't been able to find it to take a picture of it. It's around here somewhere. One of my most favorite purchases has to be the Farm Chicks Cookbook. I even got Teri and Serena to sign it. What a great keepsake. The stories are so sweet and the recipes and photos look amazing. I can't wait to try some of them. If you don't have this one yet, what are you waiting for? Go out and get one right now. You can order one on Amazon.com right here. On the way home we made a little stop in the town of The Dalles and found a charming little antique shop called "Rerun." There I found these cuties. 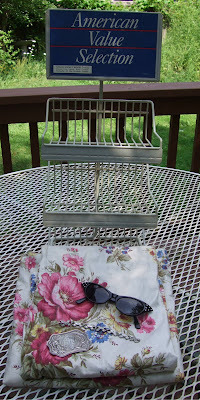 A great vintage display rack, pair of lovely chintz drapery panels, some vintage style sun glasses, a cute rhinestone bracelet and a silver buckle. Speaking of silver buckles, as I mentioned before, I sold a few of my blingy buckles at the show. This was something I never showed on my blog before, but had mentioned that I had a few "surprises" that I made for the show. Here's a picture so you can get an idea of what I'm talking about. I loved how these turned out. The second one from the top is the one I made for myself. Joy made some of these too and we both decided that we didn't care if we sold them as they are so pretty to have and look at. I am excited to make more and am now on the look out for some pretty jewels to replenish my supply. Something else I made for the show were these cute wallpaper clip boards. I had so much fun making them. 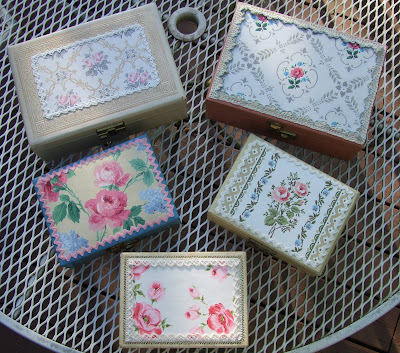 That same day I also embellished five vintage jewelry boxes with the left over wallpaper scraps. 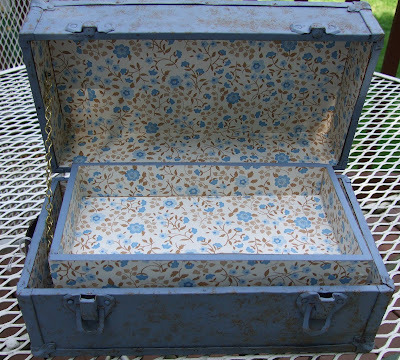 I had been collecting these boxes for awhile with every intention of making them prettier. I had a little something different in mind, but I'm loving how they turned out. I didn't sell any of them at Farm Chicks, so if you are interested in them, I will be bringing them along with me to the Barn House Flea Market on July 18th. Well, that's it for now. Today Joy, Isabel and I are road tripping it up to Puyallup to attend the "Funky Junk Sisters." It will be fun to be a shopper and we're looking forward to chatting up some of the people we weren't able to at Farm Chicks. I'll tell you all about it on my next post. 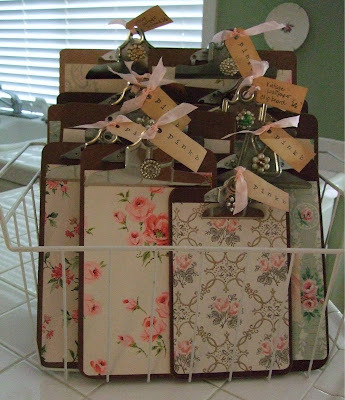 I love those little clip boards with wallpaper, sugar! Do you sell those online? I have a clip board very similiar to those! Also, the soap.... is that available online? I love looking at these pics, makes me have to go next year!! I don't mind the Farm Chicks posts! Love 'em! Those soaps smelled yummy. Can't wait to hear about the Funky Junk Sister's sale, let us know how it went! Do you sell your shopping carts online? I didn't see a connection to an online site for you. Isn't Kim fun? The show was a blast! I was at Funky Junk sale on Saturday! What a great sale with so many great treasures - I brought home many! Hope you had a great time! And on Sunday I was in downtown Sumner in an antique mall store and thought I saw Isabel and I guess I was right and I wasn't imagining things! You guys either must have been on your way to the sale or stopped in Sumner to visit the antique stores! I enjoy your pics and blog. Too bad I live so far from the fun events you sell at. Where the heck do you find all that wonderful stuff to sell?? We have nothing but yucky trash junk around here. Hey Lisa! Looks like you had a very successful show! Thanks for sharing all the fabulous pics! I'm not the least bit bored. On the contrary...you are inspiring me! Keep it up. I love the buckles. I don't blame you for keeping those a secret! Fab U Lous. What a lovely blog - just stumbled onto here and have been having such fun looking around! I love how you reclaim all the vintage furniture. I've never met a piece of junky furniture that I don't want to remix! I can't believe you still had enough energy to shop your way home from Farm chicks;-) Your booth was amazing. Can't wait to see what you have in store for next year! Looks awesome, Lisa!! Love it all. I'm glad it was so much fun! love, love, love the clip boards! So glad to have found your blog!!! After having been without a computer for 3 weeks I am finallly catching up with some blogging. What fantastic pictures! I have spent ages looking at them and having fun seeing what I would have bought had I been there. I love the pettycoats! You keep on posting. I just posted the party and have one more post to do on Farm Chicks then on to Funky Junk Sisters Sale, that Erin and I went to at the last minute. What fun. I don't know how we missed you. Thanks for keeping us smiling! I'm glad the show went well for you. I've been surprised at how good sales have been in the recession too. I guess there is always room in the budget for good junk!